I don't know how it happened so quickly, but summer totally snuck up on me this year. Now that it's here, I am trying my best to come up with some quick and easy summer vacation ideas with the kiddos. I would love to hear your recommendations, but in my quick research, I thought there may be a few other parents out there that would appreciate the info I found. I have thrown it together here for you, with a few links to other great sites. Happy summer travels!! Since we live in Charlotte, the east coast is the closest for a quick summer trip. Although not my very favorite spot to travel, we have spent some time in Myrtle Beach for recent photo shoots and really enjoyed ourselves. It's makes for a fun quick trip and my kids love it. There is a cute place called Broadway at the Beach, which we really enjoyed. Hotel prices are definitely way higher in the summer, but you can still find a good deal here and there for condo rentals. We just rented a 2-bedroom condo last weekend, which works out great with the kids. It's almost like a little home away from home and they are thrilled by that alone. The fact that it was within walking distance to the beach was a total bonus! This last trip, we went the tourist route and saw the the Pirate's Voyage dinner show and truly had a great time. My kids are still talking about it, which means it was a hit! We have also visited the Isle of Palms since moving to Charlotte. It is less than a 4 hour drive, located just outside Charleston. We found it to be super family friendly, and not quite as touristy at Myrtle Beach. We rented a house when we were there, again in walking distance to the beach and really just made it a relaxing beach-type of vacation. Prior to having children, we spent a summer vacation in Cape Cod. I would love to go back with the kiddos. It was such old-fashion fun, and the seafood was incredible! We rode bikes around Martha's Vineyard and at lunch on the water. This is definitely on my to-do list one summer soon! Here is a nice little list of things to do with the kids in Cape Cod, with reviews, which I always find helpful. San Diego is one my favorite places in CA. The zoo is world-famous and the weather is pretty much perfect! We also recently heard about the LEGOLAND not too far away, and my kids have been begging for this trip every since. I even heard that you can choose the decor of your room - adventurer, royalty or pirate...too cool! Santa Monica is also a great vacation spot. With the famous pier and miles of sand, it just makes you feel like you are on a vacation. I loved the energy at this place, watching people play around on the gymnastics equipment right there on the beach, playing volleyball, and just having a good time...it's a bit infectious! There is long list of fun things to do here, and you can find all of the details at their website here. Of course Disney Land is not too far away, but I've never been there, so can't speak personally on that one. I'm not sure where he got it, but my son (who is only 2 years old) has been asking to go to Mexico for a full year now. When he hops on his little tricycle and we ask where he is going, he almost always responds with "Mexico". Hopeful little guy! So, one of these days, I would really like to take the kids down to an all-inclusive. I've done a bit of research and have found Dreams Resorts to be very kid-friendly from reviews, but there are really tons of options. We have always traveled to the Playa Del Carmen area as a couple, but recently stayed in Cancun at an adults-only resort called Live Aqua and LOVED it! If we take the kids, I think it will be more about the resort than the location, as the kid options would be the most important to me then. Punta Cana:We took the kids (and my mom) to an all-inclusive resort in Punta Cana for my mom's surprise 60th birthday last year. We had a wonderful time, and the kids loved every minute. Funny, their most memorable experience was the free unlimited fruit smoothies, but at least it was memorable for them! Although we had a fantastic time, I would say that I find the food to be significantly better in Mexico, so would be more likely to make that my destination of choice next time around. I saw this quote today, and found myself in a moment of thought...which is rare around my office, usually not so much time to actually think! Anyhow, this one really resonated with me today. There are many days in this business and in life where I run on high-speed, handling the daily decisions the best way possible, overcoming obstacles, and creating solutions. Then, there is the occasion, to be quite honest with you, where I am deeply challenged and not quite sure how to handle it. To take a step back, I am not your average CEO. My formal education is not from a fancy Ivy League school. My parents, although both extremely talented and hard-working in their own right, do not have a college education. I am not the most well-spoken person you have ever met, nor the best-read. I try my best to keep up. I have two children that are at the top of my priority list, and this business was really baby #1 before they were born. I read a great business book when I can fit it in between days in search of carousels (my sons request this weekend), and I challenge myself to learn from others whenever possible. I think for the most part, I do okay most days. Really, I am not unlike most of you reading this post, most likely. We are just 'normal' people working super hard to do the best we possible can. So, back to those challenged moments. I realized today that these challenges I face, are truly my most valuable teachers. Whether a loved one, an employee, or a vendor, those that challenge me, often force me to take a step back and evaluate. I evaluate my actions, the actions of others, ways to improve, and ways to grow. In retrospect, I should be grateful to these people. I should also remember in those moments that these will be the people to lift me higher, to make me better, and to teach me the most. 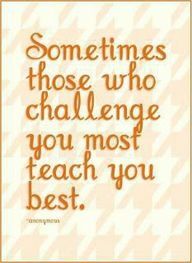 Do you have someone challenging you at the moment? In writing this blog, I often think it a bit silly to write about my life...really everyone has their own lives to worry about, why care about mine? But, I do it in hopes that what I am going through at the moment may touch someone else. May, the unlikely chance, be just what they needed to read that day. If you are being challenged by someone in this moment, maybe this perspective can help...what are they teaching you? I'm fairly certain I am stronger, wiser, and maybe even enlightened by the people that have pushed, tested, and challenged me the most. I may not have enjoyed the process (to say the least), but I am grateful for it.